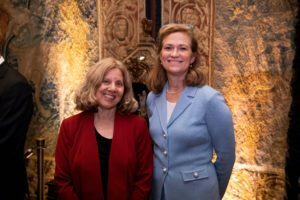 WASHINGTON, DC, Oct 31 – L. M. Elliott received the 2018 Grateful American Book Prize for her historical novel, Suspect Red. Published by Hyperion-Disney, the book takes a look at McCarthyism and the Red Scare, in a manner that will excite young readers, according to David Bruce Smith, co-founder of the Prize. Elliott garnered an Honorable Mention award for Hamilton and Peggy! A Revolutionary Friendship, published by HarperCollins and Katherine Tegen Books. It’s the first time an author received the Prize and an Honorable Mention, simultaneously. 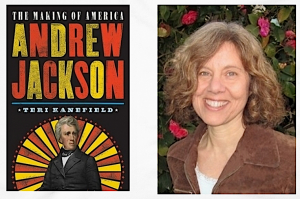 Teri Kanefield got an Honorable Mention for her biography of Andrew Jackson—part of Harry N. Abrams’ The Making of America series, for which the author has already written Alexander Hamilton (2017) and Abraham Lincoln (2018). Susan B. Anthony and Franklin Delano Roosevelt will appear in 2019, and the release date of Thurgood Marshall is pending. 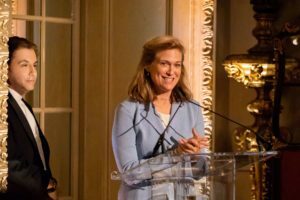 The Grateful American Book Prize comes with an award of $13,000, a lifetime pass to the New-York Historical Society, and a medallion created by the American artist, Clarice Smith. 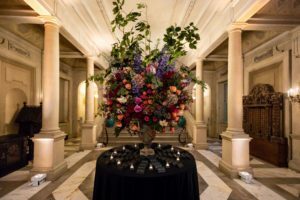 The October 11, 2018 presentation was at The Society of the Cincinnati in Washington, D.C. The “Honorable Mention” authors receive the medallion, and $500 each. Did someone say “East Coast”? 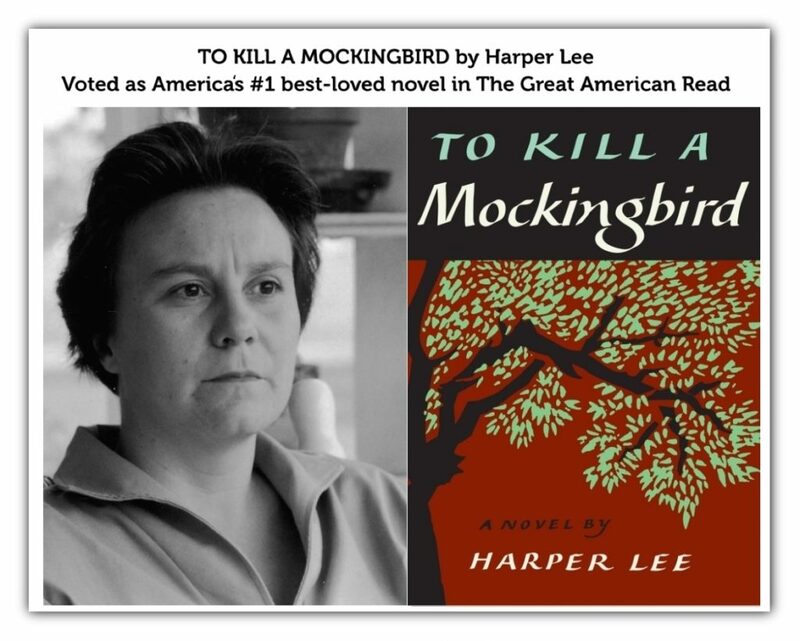 To Kill a Mockingbird lead The Great American Read voting from the first week, and kept the lead for the entire five months of voting, despite strong competition from the rest of our five finalists. It also topped the list of votes in every state except North Carolina (who went for Outlander) and Wyoming (who preferred Lord of The Rings). Such widespread support from readers across the country make To Kill a Mockingbird a worthy winner of The Great American Read. See the FULL LIST of the top 100 books. A Farewell to Arms by Ernest Hemingway. The seminal tale of an American ambulance driver and English nurse finding love in Italy amid the carnage of World War I. 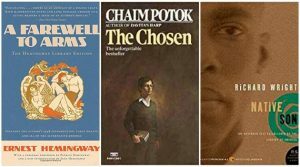 The Chosen by Chaim Potok. Two Jewish boys — one Hasidic, the other Orthodox — form an unlikely and enduring friendship in post-WWII Brooklyn. Native Son by Richard Wright. Poverty and race collide in 1930s Chicago in this searing story of Bigger Thomas, a young black man who commits an unthinkable act. Mark your calendars and get your tickets now. Tickets on sale: Oct 18, 10AM Pacific. A voluptuous flirt refuses to consummate her marriage to an older man. Doris Grumbach’s CHAMBER MUSIC; a ninety-year-old widow reflects on her marriage to a famous composer. A couple’s life changes when 12 penguins turn their household upside down. WASHINGTON, DC, Oct 11 – L. M. Elliott will receive the 2018 Grateful American Book Prize tonight for her historical novel, Suspect Red. 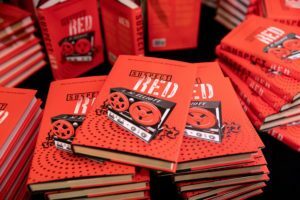 Published by Hyperion-Disney, the book takes a look at McCarthyism and the Red Scare, in a manner that will excite young readers, according to David Bruce Smith, co-founder of the Prize. Elliott will also garner an Honorable Mention award for Hamilton and Peggy! A Revolutionary Friendship, published by HarperCollins and Katherine Tegen Books. It’s the first time an author has gotten the Prize and an Honorable Mention, simultaneously. Teri Kanefield will get an Honorable Mention for her biography of Andrew Jackson—part of Harry N. Abrams’ The Making of America series, for which the author has already written Alexander Hamilton (2017) and Abraham Lincoln (2018). Susan B. Anthony and Franklin Delano Roosevelt will appear in 2019, and the release date of Thurgood Marshall is pending. Imagine: having to live through adolescence twice. For many, the very thought would be intolerable because it would mean re-visiting a time of defiant development, complicated by the horrors of hormones, the hellishness of hearsay, and humbling humiliation. And, however you might try to feather in friends, either as: a geek, a jock, or a cheerleader; a mean girl; a girly girl, a peacemaker, or neither; a rocker, a drifter, a gamer, or a pleaser; a loner, a hipster, a greaser or a gangster; a stoner, a slacker, or a troublemaker no one catapults, comfortably, over the jagged edges of adulthood in the making. 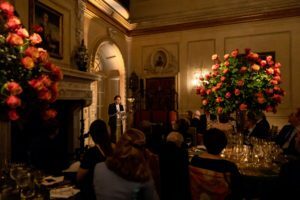 Fortunately, for our purposes there are excellent writers, like the 61 novelists, journalists, and poets, who competed for this year’s prize. They truly understand and, guide the tough times of teenage turbulence in ways authors of the past couldn’t or wouldn’t. 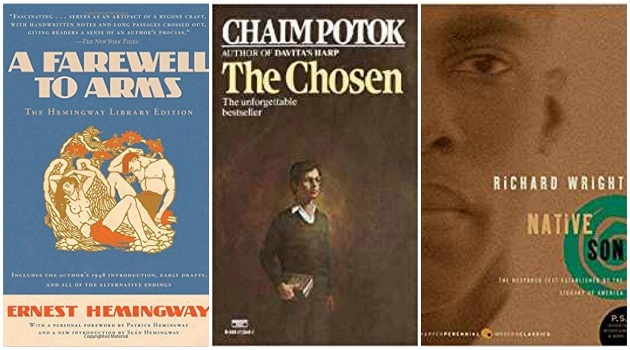 The Grateful American Book Prize was begun to prompt the creators of Young Adult Literature to think up superlative stories in the genres of historical fiction, and non-fiction for 7th to 9th graders. This is the only accolade of its kind in existence. In the early days of the Prize, we — my judges and I anticipated a spectrum of pedestrian to provocative books, along with a ramp up of passable-to-painterly illustrations. Then, after our review, the book with the best prose-to-picture synergy would win. Except: there was an unexpected pivot during the process. It turns out: 7th to 9th graders generally rebuff image-laden books, because they are considered babyish. Kids of those ages are on the cusp of the childhood, no childhood phase, and they want to be thought of as adults or at least, sort-of-adults. The concept, then, of tagging illuminating illustrations to writing that Wowed had to shift, slightly – along with the anxieties, adjustments, advancements and abatements associated with coming of age. Instead, we searched for polished prose; well – crafted characters; meaningful metaphors; mindful moods, and absolute historical accuracy. Originally, the idea for the Prize, was given to me in late 2014 – by the writer and scholar, Dr. Bruce Cole. Two months later, it was rolled out, and a mentor protégée relationship was begun. The Prize process was practically perfect throughout 2015, 2016, and 2017. Then, in January of 2018 Bruce died, suddenly and, for everybody who knew him: family, friends, students, colleagues, and acquaintances this was not a usual loss. 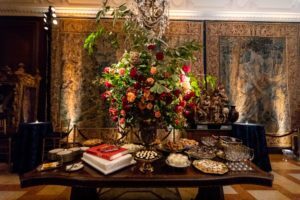 Bruce was a moral, meticulous, mannered man, with a specialty in the Renaissance that he adapted to the present. He was a savvy sophisticated sage with a kinetic knowledge which captivated his classes at Indiana University for decades. 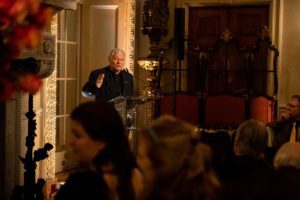 During his record – long, eight-year chairmanship of the National Endowment For the Humanities, he produced programs of excellence — with unyielding mission of pushing the arts out to the public, imaginatively. Hid “Picturing America”, which explained our Art and History, tentacled to 80,000 schools and libraries, while his Digital Humanities Initiative opened America’s cultural archives — on line — to millions. My friend Michael Poliakoff, has said that “Bruce democratized the arts.” And, his influence, which was unusually thorough and deep, was noticed in the highest of hierarchies. In 2008 George Bush presented Bruce with the Presidential Citizens Medal for his work in ensuring that the country’s heritage was passed on to future generations. During the past few months, we – the – judges have had Bruces’s labors and legacy very much on our minds, as we absorbed a rainbow of reads from: Slavery, suffrage, sunken ships and segregated sports, to: Malcontent, miscegenation, murder and Maya, Lin; reds, riots, roughed-up reservations and redcoats. Based – in part on Bruces’s compelling, criteria, the winner of the 2018 Grateful American Book Prize is L. M. Elliott for: Suspect Red, a novel that recalls the communist craze hatched and heated up by Joseph McCarthy, in 1950’s America. There are three components to the Prize: A $13,000.00 payment that honors the 13 original colonies. A lifetime pass to the New-York Historical Society, and its hallowed objects. This is to celebrate knowledge and The Medal, designed by my mother, Clarice, which recognizes art at its best. We also chose two books worthy of “Honorable Mention”, but this year we have a precedent, Laura is a double winner, so one of the “Honorables” goes to her, for her novel, “Hamilton and Peggy! 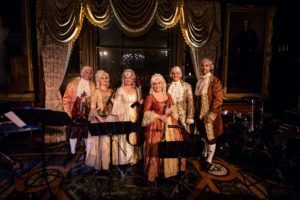 A Revolutionary Friendship.” This is a reconstruction of Alexander Hamilton’s close relationship with his future sister-in-law, Peggy Schulyer. It turns our, that while he was George Washington’s aide-de-camp. Hamilton, already acquainted with the Schulyer family, wrote Peggy for advice, about how to court her sister, Eliza. The second Honorable Mention goes to Teri Kanefield for “Andrew Jackson: The Making of America”. Born into a backwoods Carolina family, without social or material advantages, the future 7th president, was uncomfortable about his modest background — and education. To prove himself worthy of something, Jackson evolved into an Alpha Patriot. At 13, he joined the Revolutionary War; later, he greased his upward success via fistfights, gunfights, gambling, duels and finding friends to finesse his future. Afterwards, he went into politics, loathed it, and re-joined the military. Eventually, he emerged as a national hero-general for defeating the British in the Battle of New Orleans. That victory ended the War of 1812. In his 1828 and 1832 pitches for the presidency, Jackson, by then, burnished with battle glow, positioned himself as an underdog who would work for the people, and defy the Educated Elitist Eastern Establishment. He was distrustful of financiers, and disdainful of the Indians. Jackson invalidated their treaties with the Government, seized their lands, despite the rulings of John Marshall’s court against it, and banished the Native Americans to the west. That long, slow, hot walk across the continent came to be known as: The Trail of Tears. 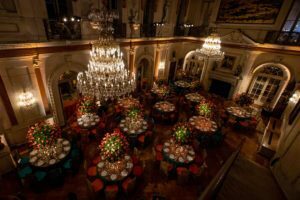 Thank-you – Especially: to all of our past winners who are here: Kathy Cannon Wiechman, Chris Stevenson and Margot Lee Shetterley.